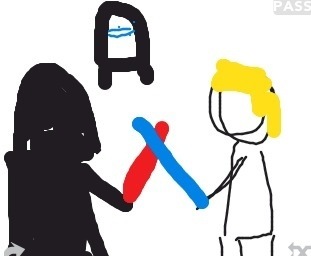 Katy Lou’s illustration of Star Wars in Draw Something. Love the Darth Vader vs Luke Skywalker here. 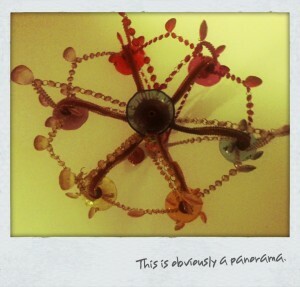 Less panorama, more photo-stitch, but actually done with Photosynth in the end. Seeing as it is even less pano than normal, I elected to do some post-processing in Camera+ (a neat replacement for the standard iPhone camera app) and used a vintage style filter thing (Instagram-esque) and Polaroid frame. I’ll leave you to work out what it is. Not exactly hard is it? As an update to this post about Siri voice unrecognition, you will be glad to know that the iOS 5.0.1 update (with better support for Australian English) has had a profoundly positive impact on said individuals interaction with Siri. Just a caveat here: the person in question is not Australian and has never even been there. I’ve been using Photosynth (my favourite M$ product) since about the day I got my hand-me-down iPhone 3GS a couple of months ago and I’m generally quite taken with the results it produces. It is certainly more impressive – primarily because of the ability to do vertical and horizontal axis – than Dermandar and I’m a bit of a sucker for the 3D/QTVR style interaction both on the iPhone and on the Photosynth.net site too. On a quiet day last week I finally got the opportunity to strap my iPhone to a tripod to do a panorama of a not terribly interesting location I’m afraid. The majorly borked section was too close to the iPhone and it just couldn’t resolve it. In general though, it’s worth pursuing the tripod option. Here he be – Silverlight required. Frogger with animals what can control time.